Food Attraction Managing Director Jake Karia. 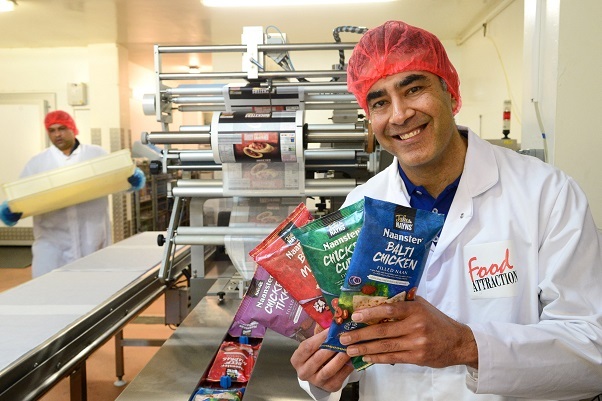 A food manufacturer based in Leicester has benefited from a grant of nearly £19,000 from the Collaborate business support project that helps growing small and medium-sized businesses in Leicester and Leicestershire. Food Attraction is run by Jake Karia, brother Nayesh and wife Neeyantee. It has grown rapidly since starting up in 2013, employs 52 people and holds the highest hygiene accreditation (AA Level) as well as being an Investor in People. However, there was a need to increase capacity to produce snacks for more customers and one of the challenges Food Attraction faced was around the cardboard packaging of one of their products, which wasn’t working for customers. Food Attraction used a Collaborate grant of £18,846 to buy a new flow wrapping machine which allows it to change the way in which it packs products to make them more appealing. Three new jobs will be created as a consequence of the increased output volume. Managing Director, Jake said: “As a result of this investment we’ve seen a growth in supermarket sales and we’re in serious talks with other retailers and sport stadiums to stock the Naanster.